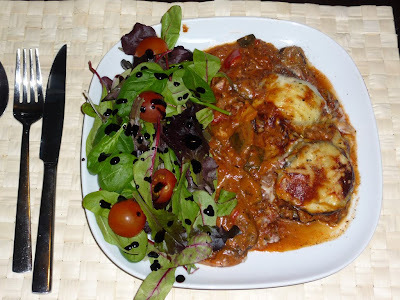 Still, having looked at the other recipes out there I've realised that mine is a little different - lamb mince is usually used - but that still doesn't mean I can call this anything else, dammit! But we found that 1/6th was perfectly adequate - depends how hungry you're feeling really! 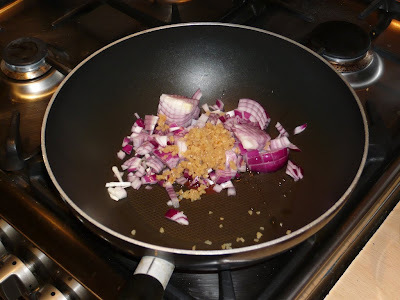 Add the chopped onion, galic and olive oil to a pan and cook until browned and softened. Then add the beef mince with some water, the stock cube and the herbs and spices. 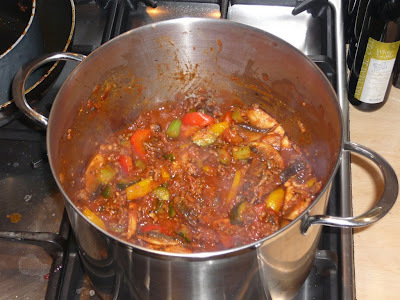 Once the meat has browned sufficiently add the tomato puree and then begin adding the firmer of the vegetables (e.g. 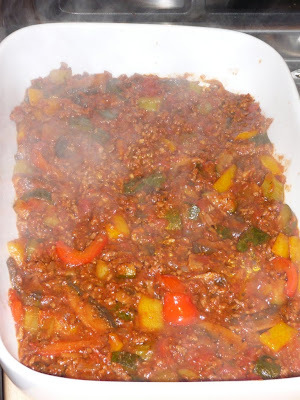 celery and peppers), cook for a few mins, then add the courgettes and the tinned tomatoes, all the time stirring continously. Next add the mushrooms, stir thoroughly and turn down the heat and allow to simmer slowly while you set about making the cheese sauce. You might find that you've run out of room in the pan you're using... I did, I usually cook with a wok but it wasn't large enough so I transferred the mixture to a bigger pan! The sauce is very simple to make. First you melt the butter/spread (I used Bertolli spread as we don't tend to keep real butter in the house anymore) in a non-stick saucepan over a low heat. Then you slowly add the milk and flour... bit by bit, stirring continuously with a wooden spoon to prevent lumps. Only use 80 - 100g of the cheese for the sauce as the rest you'll want to keep back to sprinkle over the top. 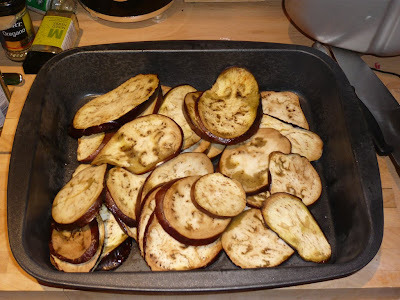 Once the sauce is ready turn off the heat, take the aubergines out of the oven and put to one side. Take a large lasagna dish and spoon a layer of the mixture into it - use approx half the mixture though no more - basically just enough so you can't see any of the base of the dish. 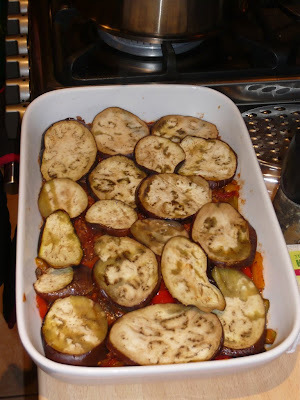 Then take half of your aubergines and form a layer over the mixture - like you'd do with lasagne sheets, though obviously this more like Tetris as there are more pieces of varying shapes! I used a wide but shallow dish - if you use a deeper narrower dish you can make more layers so you might want to split the sauce say into thirds instead. 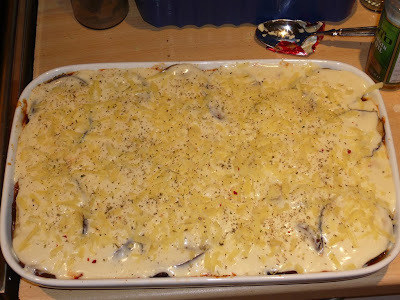 Next spoon the remainder of the mixture over the aubergines and cheese sauce and press down with the back of a spoon. 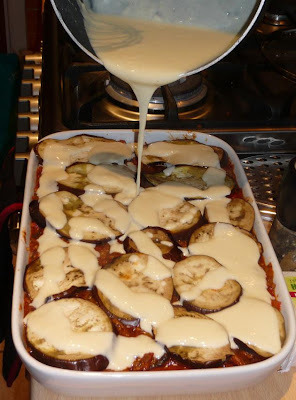 Repeat the above using up the remaining aubergines and spread on the rest of the cheese sauce. When ready, leave to cool for about 5 mins or so. I'm gonna give that a try! 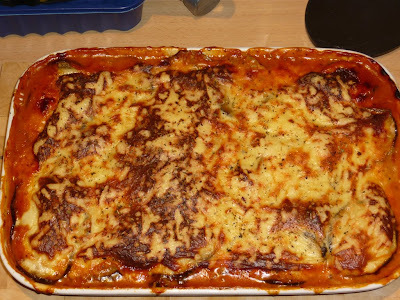 I love lasagne but am not keen on pasta sheets, so aubergines make a perfect substitution! My son's decided he's not an aubergine fan, dammit! 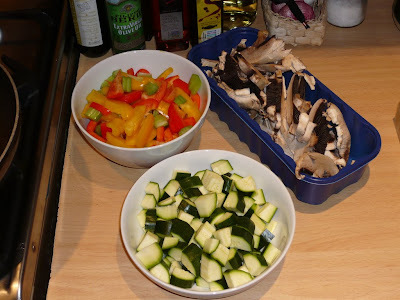 He likes every other veg (apart from mushrooms which he's not keen on).